The Honeycrisp Apple, Archive 365, Droid Shots, The Minnesota Landscape Arboretum, Chaska, Minnesota, September 2012, photos © 2012-2013 by QuoinMonkey. All rights reserved. Apples were a crisp, healthy snack when I was growing up. The apple varieties I was most familiar with then were Red Delicious and Granny Smiths. On a recent trip to the grocery store, I was introduced to two apples I had never tasted before: the KIKU and the Ambrosia. If you draw a thermometer and add a scale from sweet to tart, here’s where they fit in: SWEET — KIKU, Fuji, Ambrosia, Gala, Jonagold, Cameo, Golden Delicious, Red Delicious, Honeycrisp, Kanzi, Braeburn, Pink Lady, Granny Smith — TART. Apples are closely linked to place, and many of us are familiar with the Gala from New Zealand or the Fuji from Japan (both developed in the 1930s). In the history of the apple industry, the three varieties I favor are relatively new to the world. The Ambrosia originated in the 1990s in the Similkameen Valley of British Columbia, Canada where the Mother Tree still lives. 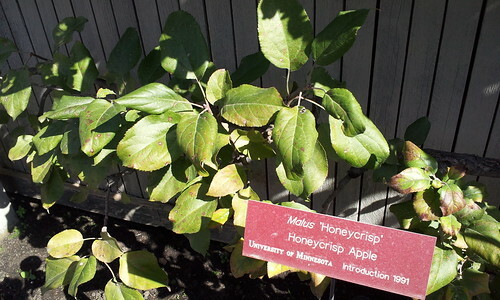 Local favorite the Honeycrisp was developed by the University of Minnesota and introduced in 1991. The Honeycrisp is a cross between a Macoun and a Honeygold (the Honeygold itself a cross between the Golden Delicious and Haralson). The KIKU came about in 1990 when Luis Braun, the South Tyrolean apple expert, was traveling through Japan and discovered a branch in an orchard, which a few years later would become the sweet KIKU apple. Where does your mind go when I say apple? Is it your first bite of a lunchtime snack, a trip where you picked orchard apples with your family, or the smell of fresh apple pie right out of the oven (check out this great apple pie recipe from ybonesy: 1-2-3! Apple Pie Gluten-Free!). Are you reminded of a computer company? Or perhaps a certain snake and the precursor to the Seven Deadly Sins (another good Writing Topic). 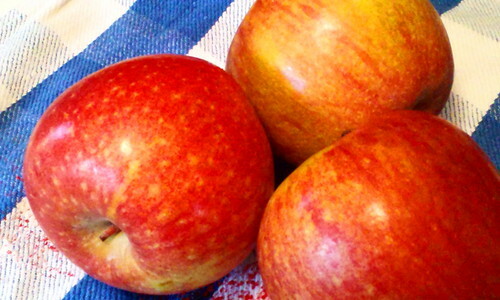 Do you believe the adage, An apple a day keeps the doctor away? Let your mind wander to all the places where apples grow, and capture your impressions in a Writing Practice. The KIKU Apple, Archive 365, Droid Shots, Minneapolis, Minnesota, March 2013, photos © 2013 by QuoinMonkey. All rights reserved. Here’s to you, Aunt Annie!, image © 2009 by Bob Chrisman. All rights reserved. A cup of tea with sugar brings back memories of my first cup, the day my mother said, “You’re old enough to drink tea.” Sacks of pale orange “circus peanuts” remind me of the stale ones in Grandma Hecker’s candy dish. Homemade caramel-covered apples take me to Mrs. Wallace’s kitchen where I taste tested them the night before Halloween. Ritz crackers transport me to Mrs. Thompson’s house where we played Ring-Around-The-Rosie. Certain recipes hold special memories. I bake scalloped potatoes topped with pork chops the same way my mother did and in the same glass loaf dish. When I make Hamburger Splatter, I remember the adults who my mother babysat when they were children stopping by for the recipe. My favorite holiday dish recipe is scalloped oysters. Aunt Annie, Mom’s youngest sister, made them every Thanksgiving and Christmas. I asked my cousins why their mom fixed such an exotic dish for such meat-and-potatoes people. Neither of them knew but thought a neighbor might have given the recipe to Aunt Annie. Oysters don’t grow in northwest Missouri. My mother and her sisters didn’t have unusual tastes in food. Yet every holiday dinner, sitting next to the freshly roasted turkey, the real mashed potatoes, the green bean casserole, and the fresh raspberry pies made from home-canned raspberries, we’d find the scalloped oysters. I asked my aunt for the recipe. I didn’t want her to pass away without someone having it. “I don’t really have a recipe anymore. I just know how to make it,” she said. She wrote down the ingredients and instructions on a piece of notebook paper, which I lost the first time I used it. My recipe, which I carried in my head until now, captures the taste and consistency of the original. Scalloped oysters remind me of family gatherings when my mother, her sisters and their husbands were in their prime. I remember long prayers while we held hands followed by huge meals, hours of card games, and the feeling of being loved. Most of all I remember my Aunt Annie and Uncle Pete. They loved one another very much. They had an ease with one another and they treated each other with respect. She wasn’t always easy to live with (none of the sisters were), but Uncle Pete never fell out of love with her. I always thought, of all the sisters, Aunt Annie had the happiest marriage. © 2009 by Bob Chrisman. All rights reserved. Photographs from the 1940’s capture a dashing young man in a military uniform and a dark-haired beauty. They made a striking couple all of their lives. After he returned from the war, they bought a little house on Garden Street where they raised their three children and hosted many holiday dinners. I always envied my cousins for the parents they had. I grew closer to them as I aged. Many times I would leave my mother’s house and stop by theirs before I drove home. Aunt Annie told me stories about her sisters and the family, things my mother never mentioned. Uncle Pete would interrupt, when he could, to offer his two cents on the subject. I loved them both and came to treasure those times with just the two of them. Uncle Pete died of pancreatic cancer in October 1996. His death broke Aunt Annie’s heart. They had been married for over 50 years. She went through the motions of living for about a year before she took sick and died in December, 1997. I think that he was waiting for her when she passed. If he had anything to say about it, I know he was. Here’s the recipe for her famous scalloped oysters. I hope the recipe generates some good memories for you and your families. by Bob Chrisman. All rights reserved. Use a casserole dish that has a lid (even though the lid isn’t used except for storage of leftovers). Grease it with your choice of oil; I prefer butter. Crush enough Saltine crackers to make a layer on the bottom of the dish. Next place a layer of oysters with some liquid from the can. Cover with a layer of slices of Velveeta Cheese. Pour enough evaporated milk to wet the layers. Repeat. The amount of the ingredients given above makes about three layers. Top the dish with another layer of Velveeta Cheese. Bake until the cheese on top is melted and a warm brown, about 90 minutes (longer if you want it crustier). This dish will serve at least 8-10 people and maybe 10-14 if plenty of other food is available. You can make smaller portions by using a loaf pan and only making two layers. I do that when I have no one else to join me. The leftovers make a tasty, if unusual, breakfast treat. *The number of cans of oysters you buy will determine on how “oyster-y” you want the dish to be. I found that four cans make generous layers. I usually buy two cans of pieces-and-bits and two cans of whole oysters. **You will have approximately 1/2 can of evaporated milk left when you finish. My youngest cousin says that she uses regular milk. Hopefully you have a strong heart and clean arteries. Bon appetit. Bob Chrisman is a Kansas City, Missouri writer who frequently writes memoir about his mother, her three sisters, and their influence on his life. His other red Ravine posts include Hands, Growing Older, Goat Ranch, Stephenie Bit Me, Too, The Law Of Threes, and In Memoriam. We’d like to thank Bob for providing this recipe and the story of the aunt who inspired it. And thank you, Aunt Annie! We’ve been dreaming about scalloped oysters since last Thanksgiving, when Bob made mention of the dish in a conversation in the post Reflections On The Other National Bird. What I know about Velveeta cheese is the color. More pale orange than most cheeses. The texture. A gelatinous blob, jiggles when you shake it. The taste, well, not so much uncooked as cooked. One would be hard-pressed to get a slice of Velveeta, taken off the block, to melt in the mouth. It’d take a glass of milk, I bet, to wash it down, adhered as it would be to the roof of the mouth, like those tart molds I remember the dentist once made of my teeth. Or the body of Christ, embodied in a white round host, wedged at the top, the choking, almost suffocating from manipulating the tongue to dislodge it while the priest walked through the slow process of drinking the last of the blood of Christ and then wiping out the chalice with a green cloth that seemed too nice to treat as a washrag. And I suppose it’s fitting that Velveeta would lead me to memories of teeth molds and Communion hosts. They were all wrapped up together in my mind, the days of Hogan’s Heroes and grilled cheese sandwiches with Shasta cola after school. Friday nights at the bowling alley with Mom and Dad, me tucked under a pinball machine watching tan cordury bell bottoms of teenage boys. Sundays spent sitting with bony knees in a pew wishing I didn’t have to eat a round wafer that tasted like paper but softer. Things that melt in the mouth, or don’t, and why is it that Velveeta melts so well in a pan over heat? The mouth, isn’t it a constant 90+ degree oven?, but I guess the temperature just isn’t high enough to activate the wheys and milkfats to dance that swirling dance from solid to liquid. And what about biting into Velveeta? Already I can feel the film on my teeth, like washing globs of Elmer’s glue from one’s fingers. I don’t have qualms about eating Velveeta in sauces, dips, or casseroles. It was one of the foods of my youth, as familiar to me as potato chips or mayonnaise. Although I grew up with a natural bent for natural everything. Made my own granola out of raw oats and sesame seeds, honey and California sun-kissed raisins, when I was still a teen. Gravitated to halibut when given a choice for any selection on the long main-entree counter at Furr’s Cafeteria. Hated red meats for the veins and shunned eggs and chicken because Mom had enough of slaughtered birds and fertilized eggs when she was young, and when she was older she passed on her food aversions to us. But I still ate processed food, still ate whatever I could find in the fridge after school, even when it was a box of aging Velveeta, the open end hardened and discolored, cracked and in need of amputation. Grilled cheese sandwiches were one of the few things I could make by myself, and I picked up Janet’s preference for cutting them diagonally and then dipping the end in a puddle of ketchup before biting off a piece. I still love grilled cheese sandwiches dipped in ketchup, although I’m not a regular consumer of Velveeta nowadays. I like a sharp cheddar cheese and just this afternoon I made a green chile relleno casserole that I suppose could have been done with Velveeta, although I mixed yellow and white sharp cheddar. The cheeses melted a sort of deep amber, and being as how I’ve burned Velveeta in the crock pot, I know that even cheese that melts well over heat can turn brown if you let it get too hot. Velveeta drizzled over broccoli, slathered over corn tortilla chips, melted inside a loaf of homemade bread with pimentos and mayo and peppers, an open-loaf dip. I don’t remember specific Velveeta recipes as a kid. But I remember liking Velveeta on open-faced toast. Comfort food. Like buttery mashed potatoes, real vanilla milk shakes, homemade pizzas, macaroni and cheese, baked beans. These are comfort foods. High calorie, low cost, always warm to the touch. It’s the smearability of Velveeta that makes it a hit. The easy way you can take the blade of a stainless steel knife and spread the cheese over a slice of whole wheat without ripping or shredding the bread into little pieces that leave holes that drip down on to your lap or chin. Are you one of those people who prefers using a napkin bib? I know adults who do this at home, not in public. They are prone to drips and spatters; sometimes large-breasted women seem to catch food on their shelves. Privately we laugh about it. Publicly, that kind of clumsiness can lead to embarrassment. I’ve been thinking about Nikki Giovanni, the way she is so comfortable in her own skin. 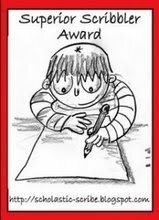 She’s been to the school of hard knocks, does not care what others think of what she writes, or shares from the heart. Not overt scare tactics or stun-gun sentences that some writers use to wake their readers up. Instead, the honest rhetoric that shoots from the heart. That kind of honesty can shock people, leave them not knowing what to say. Or thinking, should she really have said that on public radio? It doesn’t matter. She is willing to bear the consequences of her honesty. There’s a certain comfort level one needs to get to in order not to care what people think or how they will judge. There is a confidence in their writing, with their presence in the smaller pecking order of their personal families, and the larger pecking order, sometimes ruthless, that comprises the rest of the world. Is it okay to say you love Velveeta? Childhood foods, guilty pleasures. Why have foods like that become the blunt of people’s jokes. Especially those who pride themselves on eating “healthy” or only “whole foods,” food snobs. People get to make choices about how they eat, just as they do about what they say or write. To judge others based on what they eat, I don’t think so. Keep the focus on my own bare cupboards. I like Velveeta and cinnamon toast and Kool-Aid. I don’t really care who knows it. I made cinnamon toast just last week. It’s another comfort food. When I was a child there was a container filled with cinnamon, swirled in sugar, wound and stirred into a brown concoction ready to be shaken into the mouth of a melted butter gob on top of white Wonder bread. These days, I eat whole wheat because I like the taste better. I become the most food conscious when I am trying to lose weight. It’s true, processed foods are high calorie, not good for the heart. And the fried foods that I love can be deadly. But you can eat anything if you watch the calories. Again, who am I to judge others? There is a woman at work that most know to be the town gossip. Anything you tell her will make the rounds. It’s common knowledge, something everyone accepts about her. I watch what I say. Yet I like her. She’s abrasive, direct, honest, loves Velveeta cheese and smokes a pack of cigarettes a day. And whenever people want to know what’s going on in another part of the company, they always go to her to ferret out what she has heard. If you solicit information from the town gossip when it’s convenient for you, no need to judge her for the rest. All this, from a box of Velveeta cheese.